Mother's Day is coming up tomorrow, and what with Mrs. Tigger not in town and all, Hello Kitty figured Babu would be all alone by herself. So we decided to take her out for dinner to keep her company. 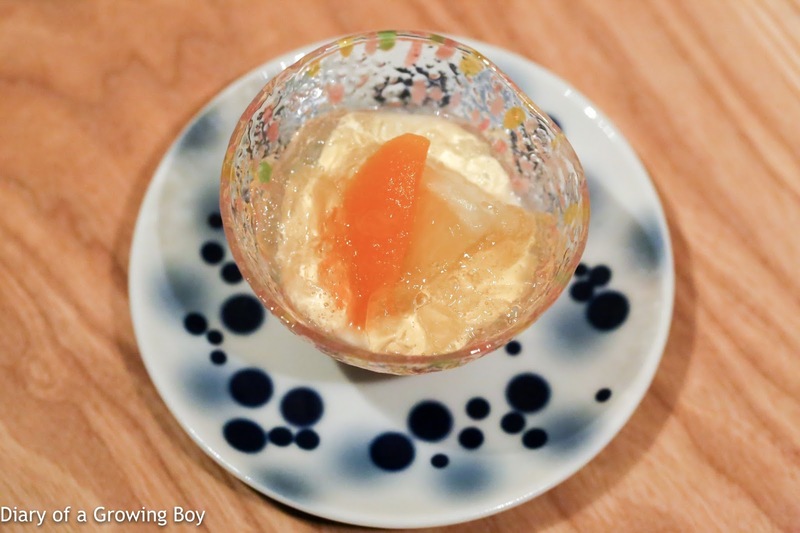 We've been long-time fans of Tenku RyuGin (天空龍吟), but as we were making plans at the last minute, we figured there would be a better chance of getting a table at La Bombance. So I reached out to the restaurant's assistant manager, and luckily we secured ourselves a table by the window. 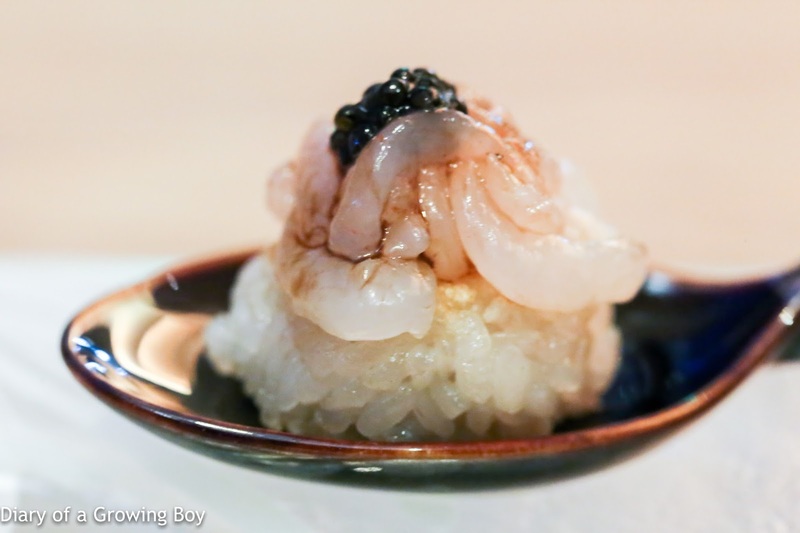 Grilled mini rice ball topped with shio shrimp and caviar (白海老、焼おにぎり、焼げ葱) - this was pretty good. The rice ball was slightly grilled, so it was crispy on the outside and there was a certain degree of chewiness. 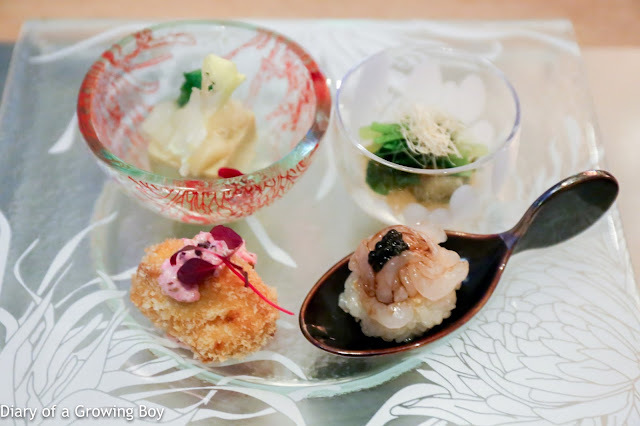 The glass shrimp from Toyama (富山県) and caviar topping was pretty tasty. Sakura shrimp croquette with pickled tartar sauce (桜エビコロッケ、赤しぼ漬汁タルタルソース) - OMG. 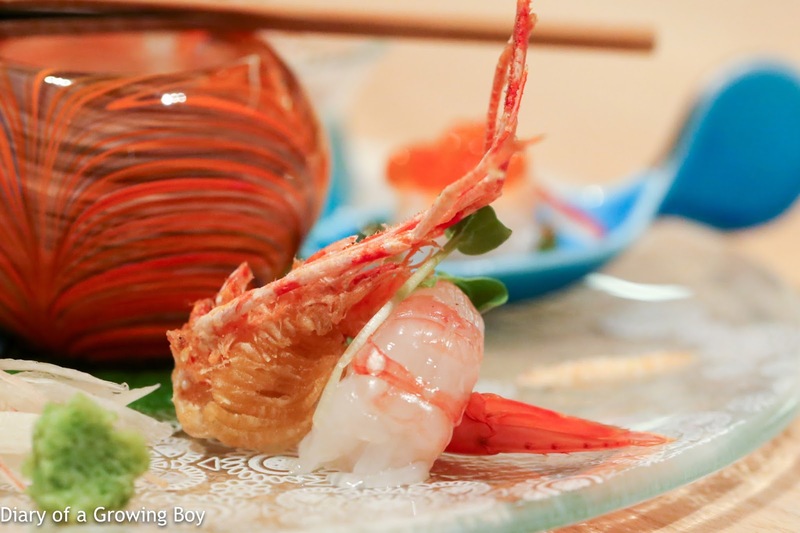 Starting with my favorite sakura shrimp (桜海老) right off the bat!!! Really, really loved this. 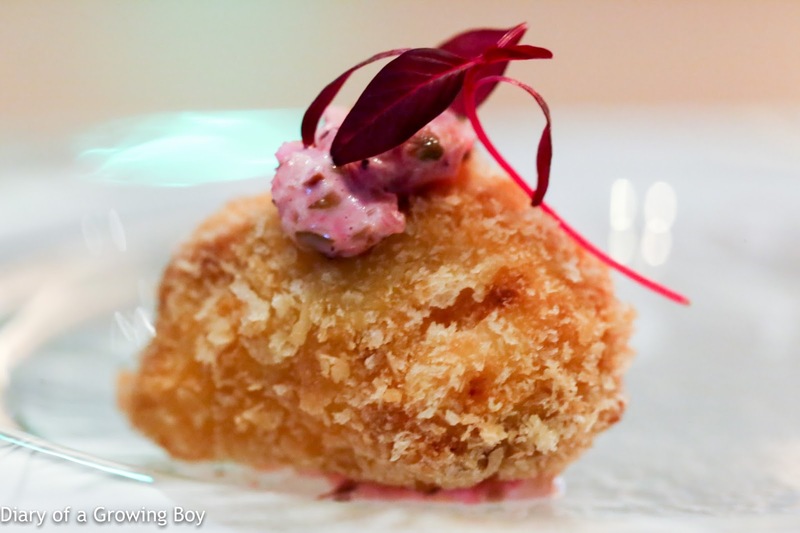 What's not to love about a lump of battered and deep-fried croquette full of shrimp flavor?! And that tartar sauce made with pickled perilla (紫蘇) was mmm mmm good. 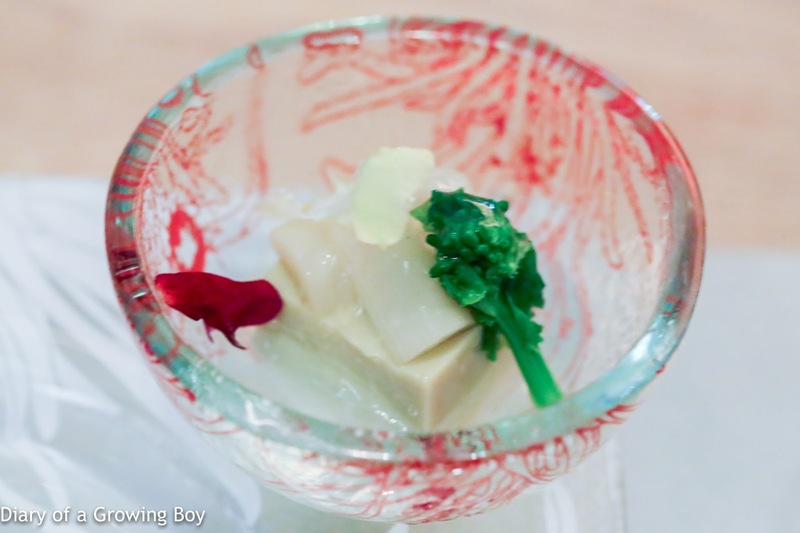 Nishin roe served with konbu, spicy wasabi leaf and tuna flakes (子持ち昆布、山葵菜辛し浸し、系賀喜) - the Pacific herring roe was crunchy as expected, and the little kick was pretty nice. Homemade crab miso tofu with spring vegetable sauce (蟹味噌豆腐、春野菜ジュレ掛け) - interesting that the tofu was made with marinated crab tomalley (蟹味噌), although I prefer the full flavors of tomalley without being diluted by tofu. Still very nice, though, with the veggies like white asparagus as well as veg gelée. Wanmono : hamaguri clam served with seafood broth, fresh prawn, scallop, hamaguri clam ball, nori, sanshou pepper leaf, lotus root, shiso blossom, chives (椀物：蛤潮汁仕立　海老、帆立、蛤真丈、四萬十海苔、木の芽、新蓮根チップ、花穂、芽葱、紅白玉あられ) - instead of the usual soft-shell turtle (鼈), we had clam as our main ingredient for the soup as part of the special Mother's Day menu. Clam broth is always tasty, and the dumpling (真丈) tonight was made with prawns, scallops, and clams. 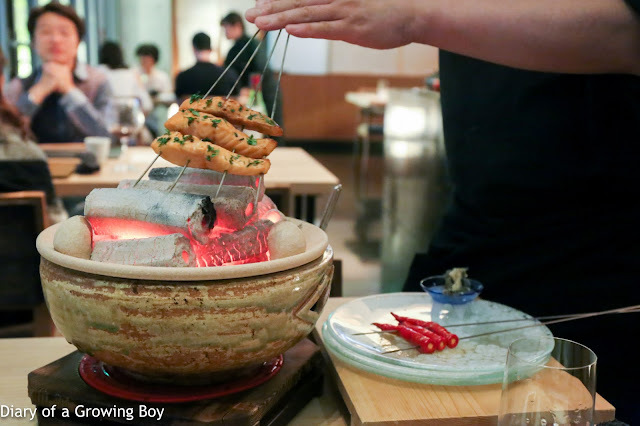 The texture of the dumpling was surprisingly mushy, but there were certainly chunks of clam inside. 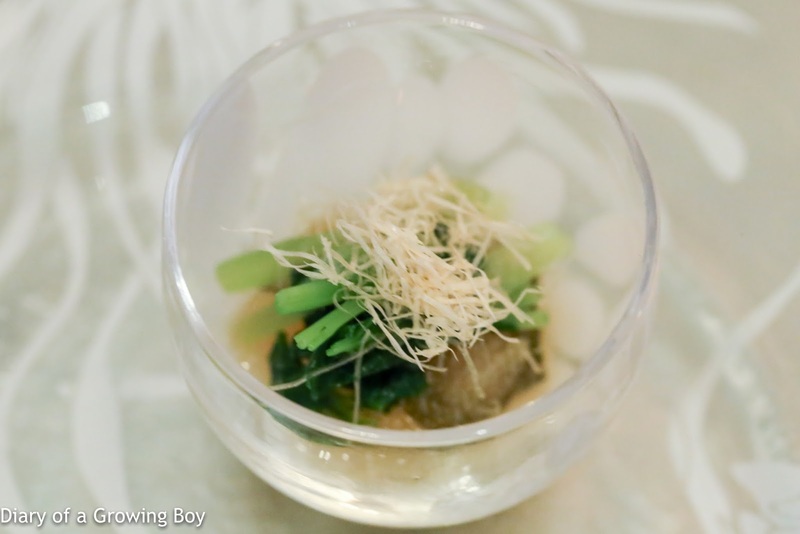 The seaweed and spring onion shoots really helped enhance the flavors of the soup, as did the red and white puffed rice balls. 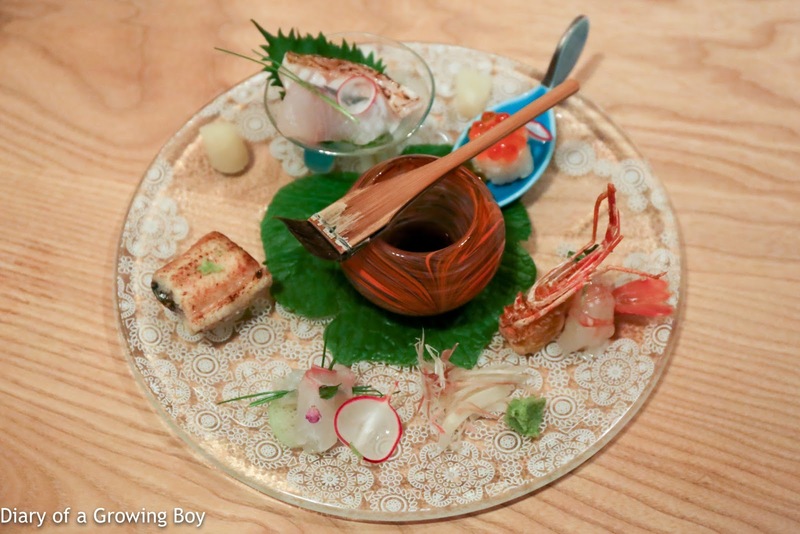 Mukozuke (造里): the assistant manager who booked my table remembered my preference not to have tuna, so a few substitutions were made for this course. 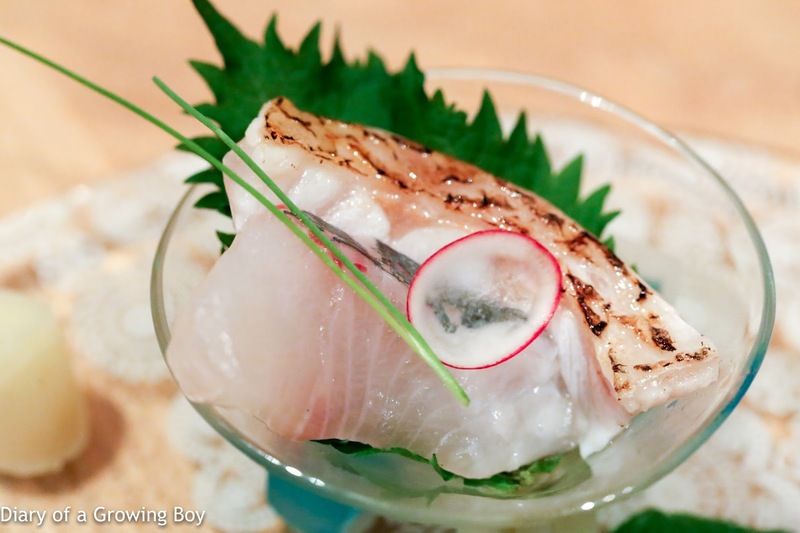 Sakura sea bream and spring onion roll (桜鯛芽葱巻) - with a little slice of taro stem (芋茎) at the bottom. Botan shrimp served with sakura salt (ボタン海老、桜エビ塩) - the botan shrimp (牡丹海老) from Hokkaido was pretty nice, served with its head deep-fried, and we were meant to use the sakura shrimp salt on the side for seasoning. 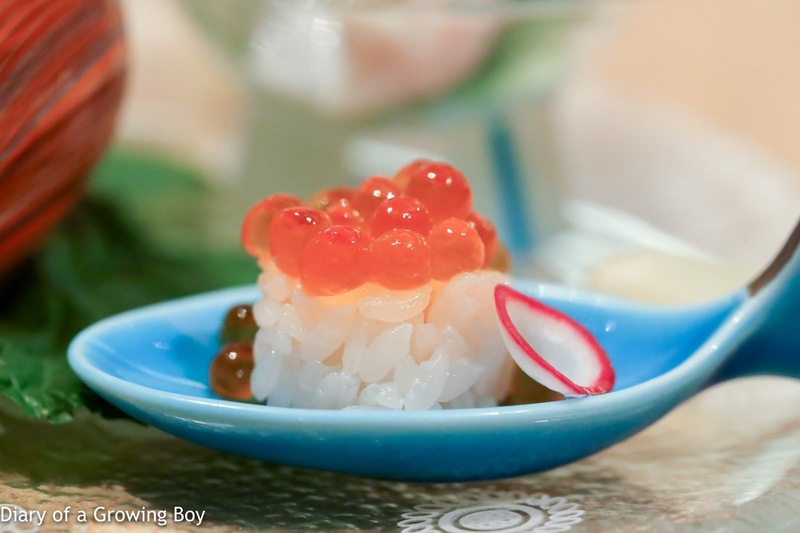 Salmon roe sushi (一口イクラ) - in lieu of chopped tuna belly and spring onion. Me likey. 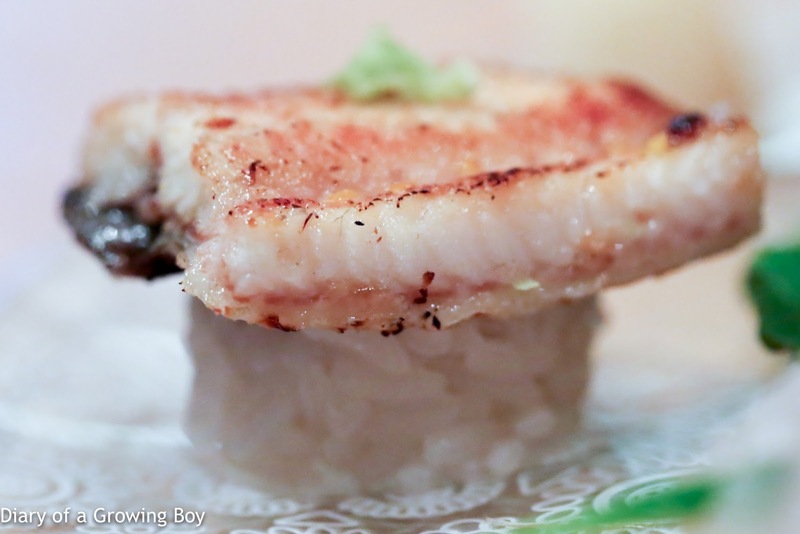 Grilled sea eel sushi (鰻) - the eel was prepared as shirayaki (志ら焼), without drenching it in sauce. Taken with some wasabi. 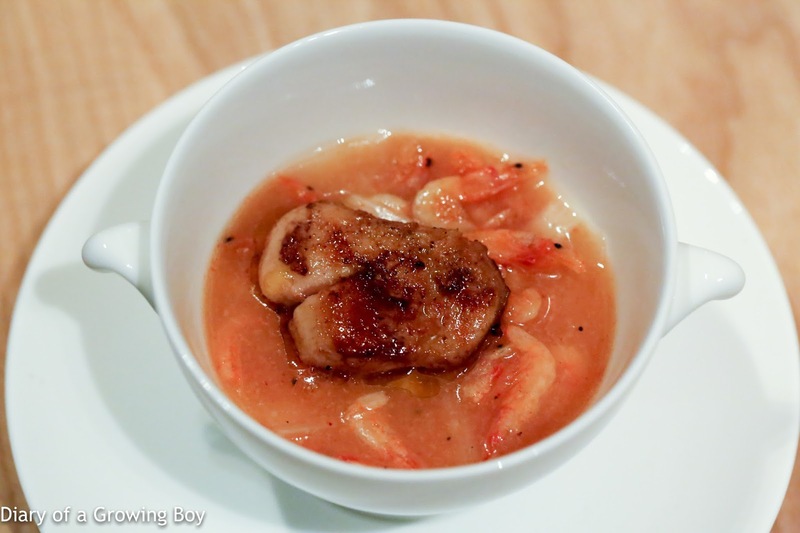 Futamono : hot egg custard topped with sakura shrimp and foie gras, served with sakura shrimp bisque (蒸し：桜エビ、フォアグラ茶碗蒸し、桜エビビスクソース) - oh man... more sakura shrimp! Apparently the egg custard was slow-cooked at 85°C, and topped with a piece of pan-fried foie gras along with plenty of sakura shrimp... Gotta say... that shrimp bisque with leeks was just incredibly tasty. We had been watching Chef Koya Takayuki (小屋孝行) slowly grill the cherry salmon (桜鱒) over charcoal for the other tables, and soon it was our turn. One could easily feel the heat radiating from the earthen pot in front of us. 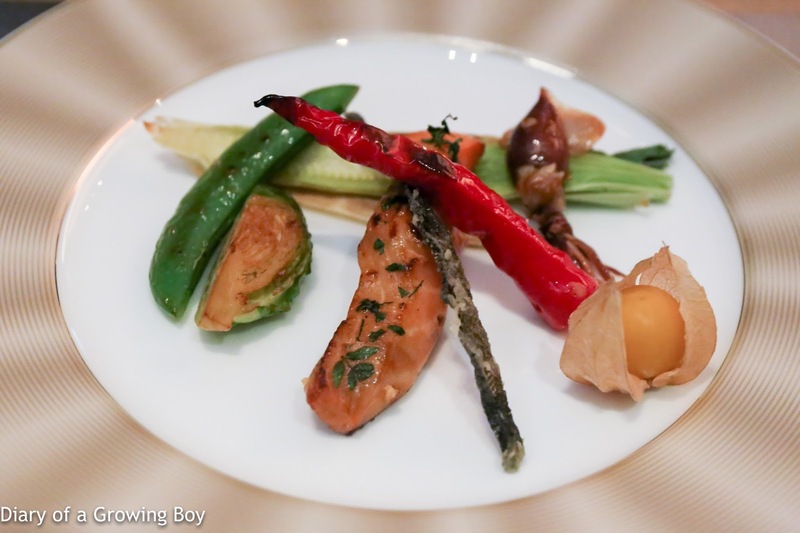 Yakimono : charcoal grilled sakura trout served with sanshou pepper leaf, pan-seared hotaru squid with heart of sweet corn and physalis (桜鱒木の芽焼、皮付ヤングコーン、ほうずきトマト) - the cherry salmon was alright, and interestingly came with some sansho leaves (木の芽) on top - although the leaves didn't have the same kick that I had expected. 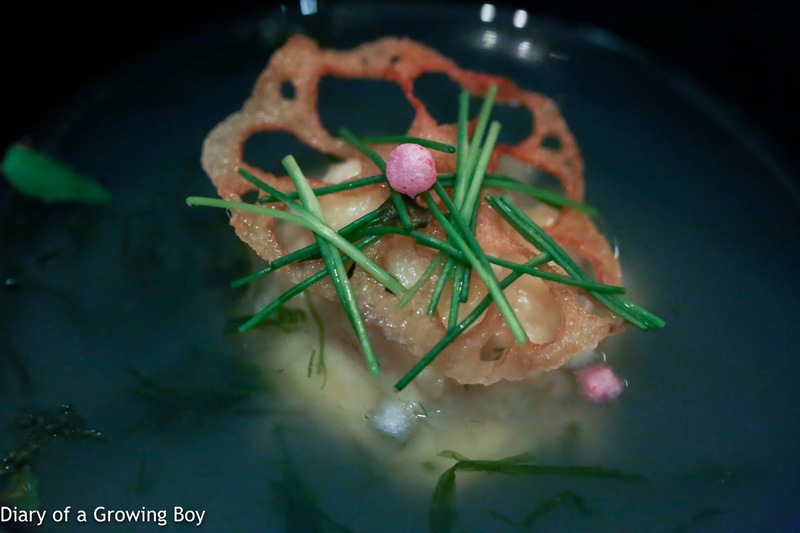 There was also a nice piece of deep-fried skin from the cherry salmon. Then we've got red pepper, Brussels sprout, sugar snap peas, baby corn, physalis, and... a delicious firefly squid (蛍烏賊). Yum! 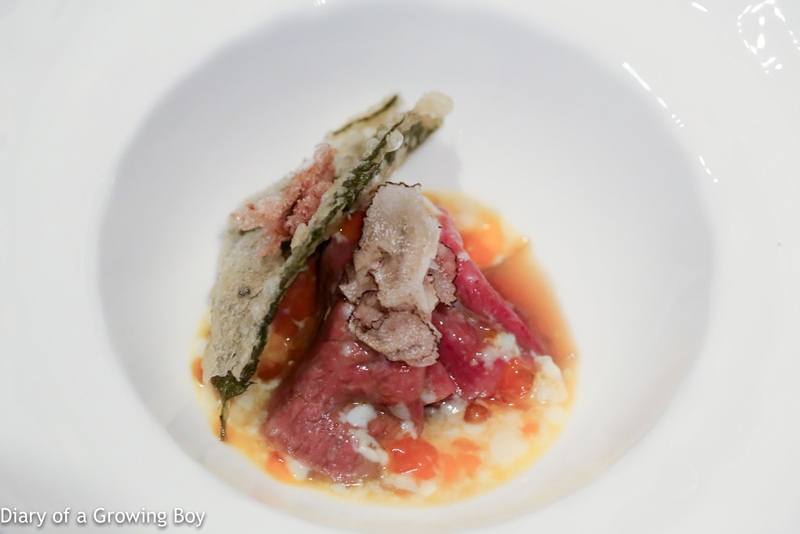 Shiizakana : Kagoshima wagyu beef roll, served with onsen egg sauce, black truffle and sakura tempura (強肴：牛ロース　スキ野菜、温泉玉子ソー、トリュフ) - this was pretty damn good. The thin slices of beef were very, very tender... and came on top of some Kyoto vegetables (京野菜). There were a few slices of summer truffle on top, and the whole thing was covered with onsen egg sauce. 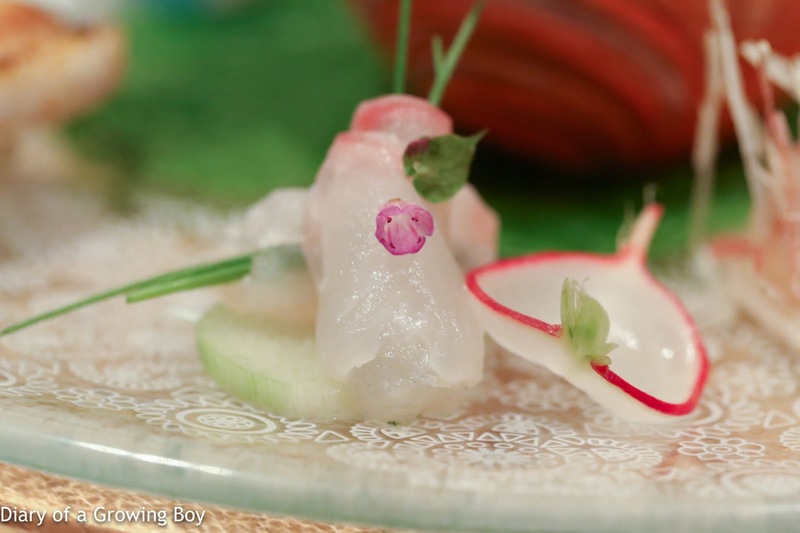 Garnished with tempura of cherry leaf. 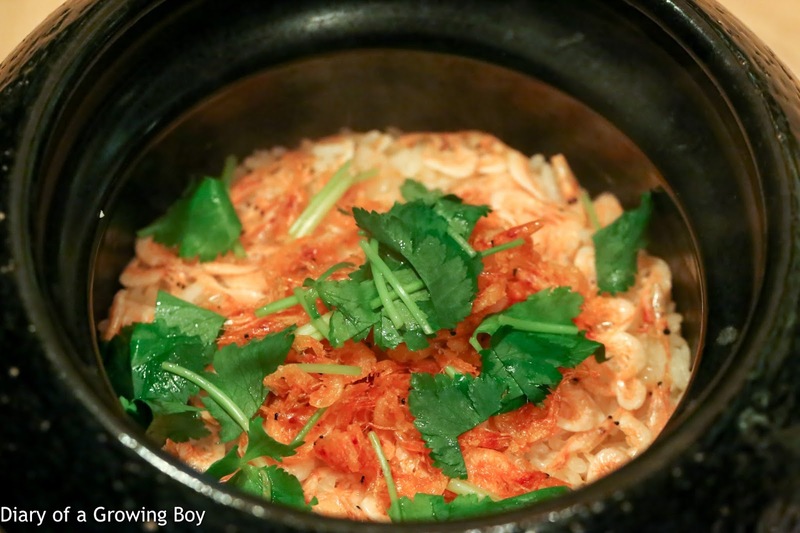 Gohan : rice served sakura shrimp in a kama pot (食事：桜エビご飯) - MORE sakura shrimp. YAY!!! DAMN GOOD. Wish there were more rice crispies. 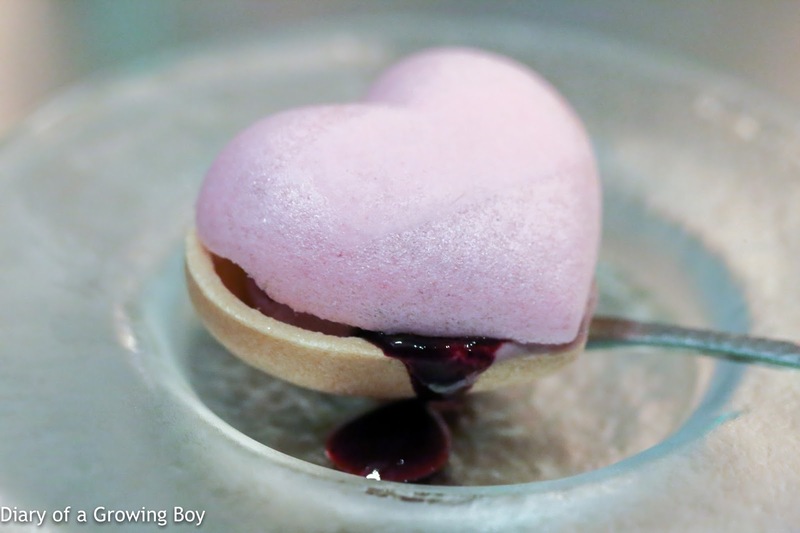 Sakura coconut blanc manger topped with hyuganatsu jelly (桜ココナツパンナコッタ、日向夏ゼリー) - very nice balance between the creaminess of the panna cotta and the fruity sweetness of the hyuganatsu (日向夏) and jelly. Fresh berries monaka (最中アイス) - not bad with that berry ice cream in the middle. 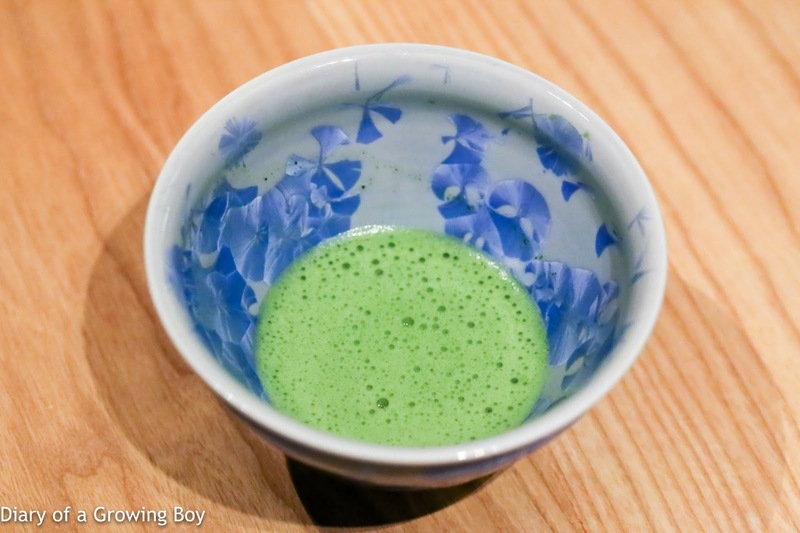 Macha (薄茶) - as usual, whisked by Chef Koya.